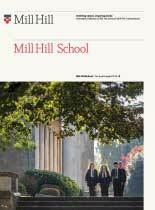 The Modern Languages Department remains one of the most forward-looking and exciting departments at Mill Hill. French, German and Spanish are currently taught in the department from beginners’ level up to GCSE and A Level (we follow the AQA specifications) and there remains a thriving programme of language-related visits to London and trips to all three countries: our link with the Collège Jean Paul II in Rouen has existed for nearly 50 years, and we have carried out an exchange programme there with our Fourth Form every year during that time. Work experience placements can be arranged for Sixth Formers. The department is well resourced with a digital language lab, a languages library, laptops for pupils and audio-visual facilities in every classroom. The teachers are passionate native or fluent speakers and we employ an assistant in each of the three languages to offer pupils extra oral lessons. We place a great deal of emphasis on teaching in the target language, using the most up-to-date, relevant and genuine resources, and on teaching literature. The department organises debating competitions in French and Spanish for Sixth Form pupils, where we invite other schools to discuss topical motions which go well beyond the themes studied at A Level. We also prepare pupils for French and Spanish Drama competitions and invite outside theatre companies to perform plays in French and Spanish in our own theatre.